Since I started christening mathematical words on Urban Dictionary, as someone who makes a living evangelizing the gospel of Singapore Math, it’s too tempting not to attempt defining the love-or-hate term, depending on your personal experience with the alien, hybrid math curriculum. Indeed, your geography or maturity would most likely determine your position or reaction vis-à-vis Singapore Math—for a number of you, not only you love Singapore Math, but Singapore Math loves you, too! Since last December, I discovered that out of the hundreds-odd math terms or phrases I had contributed to Urban Dictionary—the "anti-Wikipedia"—under different pseudonyms, one “terrorist stalker” has been serially and wickedly downvoting a number of them on a daily basis to the point that the online dictionary had to temporarily suspend and eventually remove the most downvoted entries to prevent further digital abuse or digital persecution—two of those deleted definitions involve Singapore Math. If math teachers, tutors, writers, and editors were given the assurance that they wouldn't be punished, fined, jailed, or even caned for speaking up and speaking out on the good, the bad, and the ugly of Singapore math education, it's inconceivable why Singapore couldn't potentially become a global mathematical hub of choice for those born with the mathematical gene (let’s pretend that there’s such a thing) and a sense of humor or irreverence. As a proof that we in Singapore aren’t the boring, exam-smart math educators that some outside the island-state would like to portray us, below are seven irreverent or light-hearted definitions on Singapore Math, which were approved and published on Urban Dictionary, the World's No. 1 online dictionary. Could you figure out which two of the seven definitions were "censored" or deleted? 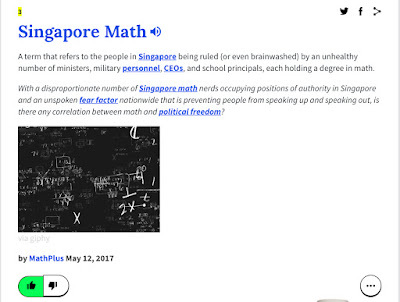 At one point, I thought maybe there is a vigilante math squad, a subset of the small army of moral and political policemen and women, recruited by the Singapore authorities to monitor any citizens or residents who try to publish any mathematical thing, which speaks ill of the government, the police, the army, and the judiciary. 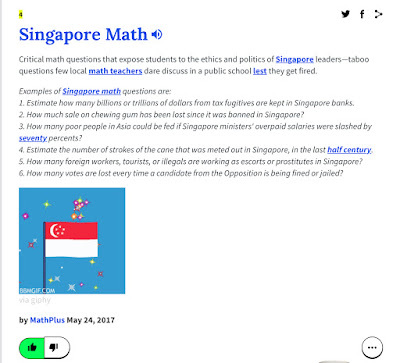 Who knows that these e-censors might be on the lookout to report any "mathematical black sheep" to the authorities, who might then threaten and sue them, if they refuse to take down any content or comment that allegedly promotes the dark side of math or math education in Singapore? 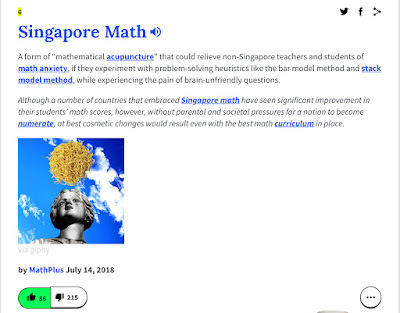 May I encourage you to redefine “Singapore Math” based on your personal experience and interaction with fellow math educators, students, parents, and caregivers (or maids-turned-tutors). 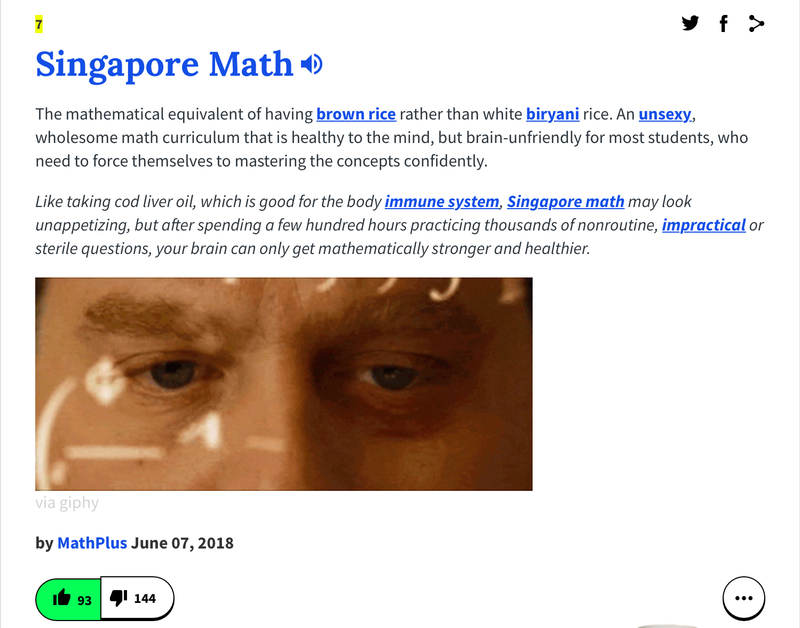 Indeed, Singapore Math has many faces, and your unique perception and definition of it would allow us to peek at a hitherto unseen (sexier or darker) side of it. It's never too late to share your definition (or frustration) with fellow math educators. 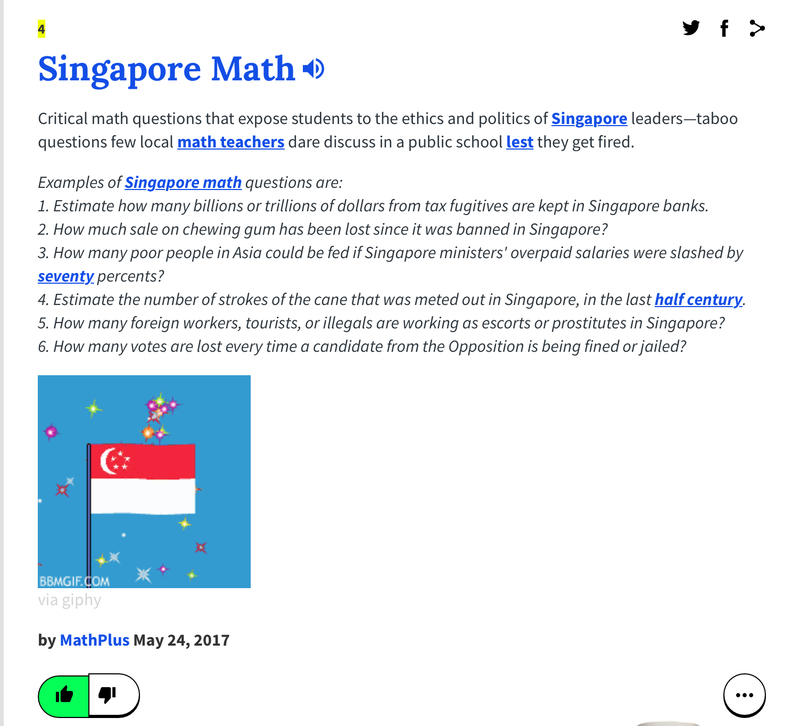 In Singapore Math, we trust!